Think about putting your own unique and creative spin on whatever you’re trying to accomplish this month. You can expect good things if put yourself out there, and if you play your cards right you can do it without having to sacrifice any of your own personal flair. Love takes center stage for you this month, with a lineup of planets (including your ruler — Venus) in your relationship sector and the Full Moon in your sign early in the month. The Lovers card reinforces that energy with the added emphasis on decisions that need to be made about where you stand and where you hope to go. In addition to feelings of love and romance that go hand in hand with the Lovers card, there’s also the added complication of being torn or pulled in two different directions, courtesy of Gemini’s natural rulership of this card. This aspect of the card refers to the need to make decisions — between two lovers potentially, or between love and something else, such as friendship, work, family commitments or even personal freedom. By the same token, you could find yourself developing romantic feelings for someone you’d previously thought of as only a friend. But be careful that you’re seeing things clearly and not just projecting romantic ideals onto someone who’s not what they seem. Neptune and Chiron are both turning direct in your 11th house this month, leaving you susceptible to flights of fancy where friends are concerned. Infatuations can develop but may also be fleeting, leaving you to clean up a mess later on. Notice all the added “weight” the woman in this card carries on her shoulders. There is the potential for it to all come crashing down, just as there is a potential for the balloon tethered the man’s hand to burst. You want to focus on what is real and present in your life right now rather than outside distractions and temptations. While you may have important decisions to make, it will be in your best interests to make them with a clear head. It may feel like things are moving very quickly for you this month, with both your work and social sectors packed. The Eight of Wands refers to progress, mobility and rapid change, usually for the better. You could be bursting at the seams with new and fresh ideas, juggling interests or overseeing different projects that all seem to be nearing completion at the same time. This card refers to being decisive, making the most of your time and cutting through whatever distractions stand in your way. There may be a lot going on around you — like the woman in the center of this card — but the Eight of Wands encourages you to remain focused and engaged in the task at hand. Look at all of the swirling colors in this card. There’s a lot happening there — and certainly some distractions. But there’s also movement, creativity and energy which are hallmarks of the Eight of Wands archetype. This is also a networking card. It relates to exchanging ideas and interacting with like-minded people. Blogging, disseminating information, and expanding social horizons are all indicated. You could receive news from afar; be preparing to embark on a spiritual journey, or planning a literal journey that takes you out of your daily routine and into uncharted territories. At least for now, you want to be taking the initiative to make things happen rather than sitting back and allowing life to just pass you by. It may involve a few risks, but with so much going on for you now your chances of acing them are high. You want to strike while the iron is hot so that you can take advantage of the opportunities that are presenting themselves to you this month. You’ll have to treat your relationships with kid gloves this month. With Mars and Pluto both moving through your relationship sector — and coming together there on the 10th — you want to be prepared for conflicts that you’ll have to deal with. The Five of Cups is not a happy card and you’re not likely to be a happy camper this month. At least where matters of the heart are concerned. But that doesn’t mean you have to stay that way. You’re going to have to confront relationship issues head on — whether that means with a partner or through your own internal process of coming to grips with the disappointments that occur. You may not have any control over what goes down, but you do have some say in how it all plays out. In how you react and respond to the hand you’re dealt. And what you do with it after the smoke has cleared. The Five of Cups can refer to a betrayal. A sense of outrage over something that didn’t pan out as you’d planned. Or regret over having put yourself out there only to be let down in the end. The woman in this card has seen better days. She sits there wrapped up in her own problems, oblivious to the colorful nightlife taking place all around her. This is one of the problems with the Five of Cups — and one that Cancers could benefit from being made more aware of. The tendency to focus so intently on your own problems that everything else fades into the background only make things worse. You’ll have straighten your posture, put a smile on your face and force yourself to participate in the world around you if you want to get over this slump. The good news for Cancers is that your 5th house is packed this month and the both of your relationship rulers are there as well. Redirect your attention toward creativity, self-expression and “play” and you’ll be on the road to chasing those blues away. This month it’s going to be all about attracting abundance and prosperity into your life courtesy of the Nine of Pentacles. This card refers to the sense of fulfillment that comes from knowing that you’ve worked hard and earned all you’ve acquired. Still there’s an air of humility and gratitude depicted here in the figure who bows in reverence to the tiny bird perched on her hand. You may be in line for a raise at work or anticipating some other type of monetary gain. You could be re-evaluating your own set of values, unrelated to your personal finances. Or you could be gazing around you in wonder at how far you’ve come and how much you’ve grown. Jupiter — ruling both your 5th house of creative self-expression and 8th house of other people’s money — is moving through your sign now as well. What this means for you is the ability to turn what you love (5th house) into a profit. Don’t underestimate the power of playfulness and joy, as these 5th house energies can manifest creatively as the spark that breaks up whatever has crystallized in your life and rendered you “stuck.” You absolutely have to love what you do in order to make this worthwhile. Sometimes the Nine of Pentacles appears as a generous benefactor or someone who opens a door for you that leads to a good financial opportunity. If this is the case, be mindful of his (or her) contribution and make sure you give credit where credit is due. Sometimes it comes not from an individual but an event that is the catalyst that leads to opportunity. Be grateful for the opportunity as it’s this shift in consciousness — to that of prosperity, abundance and gratitude — that will make all the difference in your life. What have you gotten yourself tangled up in this time and how much of it is of your own doing? The Eight of Swords speaks of being wrapped up — often in your own misery — to the extent that you’re unable to see a way out. If you look at the image in this card you can see that the woman could easily extract herself from the serpents that have entwined themselves around her and chained her to the tree. With a line-up of Scorpio planets moving through your 3rd house this month, you could be making a bigger deal out of things than you need to be. You could be taking things way too seriously or creating problems where there are none to begin with. That solution is likely right there before you, and it may be clear to others even if you can’t see it yourself. You can either unwind yourself from the restrictions that have rendered you immobile, or you retrace your steps and back yourself out the same way you came. This month you should be feeling inspired about putting some of your big ideas into practice. The Page of Pentacles speaks of an enthusiasm and a sense of promise over plans that may have been swimming around your head for some time, but that you haven’t done anything about. Until now. You’ve got four planets moving through your financial sector this month and the Full Moon takes place in your joint resources sector on the 24th. This is excellent for making money and you may even be in line for a raise or an unexpected commission. But Neptune is also moving through your work sector (and will turn direct there on the 16th), meaning that you may be more susceptible to pie-in-the-sky ideals and unrealistic expectations during this time. The Page of Pentacles is a both a self-made individual and a work in progress. But it all about “work” in the sense that it’s tedious or uninspiring. it’s about craftsmanship and inspiration as seen with the figure in this card. You could find yourself putting the finishing touches on half-finished projects in order to clear the way for something else. You could be polishing off your resume, purchasing business attire, or even boning up on your studies. All in anticipation for something bigger and better on the horizon. The Page of Pentacles is excited about creating something and perfecting it — whether it’s on the job or in other areas of his life. Whether this refers to you personally — or to someone in your life who reflects these qualities to you — the idea is to take the ball and run with it. While you may be overwhelmed with the “work” that is set out before you, if anyone is up to the task, it’s you. This month you can go a long ways toward turning your dreams into reality. The Star card is all about putting fears and restrictions aside and focusing your attention instead to your hopes, wishes and aspirations. With a line-up of planets moving through your sign this month this is likely to relate to personal areas. Such as the dreams that are nearest and dearest to your own heart. But because the Full Moon takes place in your relationship sector (on the 6th) and because both Neptune and Chiron are turning direct in your romance sector this month, don’t be surprised if it applies to your love life as well. Notice the child-like innocence depicted by the young woman standing in the middle of this card. Her eyes are closed in a dreamlike or blissful state. But see how she’s lifted up by the two colorful stallions at the base of the card. These animal guides are there to provide direction. They elevate and protect her at the same time. There’s a lot of motion in this card — from the waves at her feet (representing emotion and intuition) to the bird taking flight to the stars exploding around her and lighting up the sky. This isn’t about sitting back and letting your dreams take you where they may. It seems to be more about participating in the opportunities that surround you, actively, willingly and joyfully. Think about what you wish for this month, and what you hope to accomplish in your wildest dreams. That may have been in a state of flux in recent weeks, but with last month’s eclipse in your sign and with your ruler having recently turned direct you should be finding more clarity. The Star card says that while your hopes, dreams and wishes are all entirely reachable, you still have to put your faith in something — the Universe, the process, and most of all yourself — in order to attain them. This month it’s more about taking a break from all the external distractions that surround you and seeking your answers from within. And while the figure in this card may lack human companionship, she’s far from alone. Notice the birds and fish that surround her, which may or may not be real. They may just reflect the psychic content of her own thoughts and ideas. Be careful that you don’t spend so much time in your head that you miss out on opportunities that present themselves.They may seem random in the moment but reveal themselves later to be much more important than you’d realized. Your social calendar should overflowing with opportunities this month, thanks to a lineup of planets — including your ruler (Saturn) and your romance ruler (Venus) — all in your friendship sector. The focus is on merriment and gaiety rather than monotony and drudgery. By the way, there may be a bit of that too. With Mars and Pluto moving through your sign all month (and coming together on the 10th), you won’t get away with partying all the way through. But if the focus is on interacting and networking with others, you can push aside some of the more serious considerations at least for the time being. Pay attention to new people coming into your life during this time too. You could find yourself developing friendships with people that seem random at first but turn into important connections over time. Starting around the the 16th when Venus moves into your 12th house — soon to be followed by the Sun and Mercury — things start to slow down. Although you’re likely to be feeling less sociable after that point, the connections you’ve made can remain just as strong. It’s time to get serious about the areas in your life that call for you to act with authority. But with several planets now lined up in your public sector, it’s time to start thinking about moving up in the world. And in order to do that, you’re going to have to think about presenting yourself as a more authoritative figure. This is not the time to play coy or skirt important issues. It’s not the time to mince words. The Queen of Swords paints a strong, confident and self-imposing figure. She’s not one to be trifled with. She knows what she wants and knows how to speak her mind. And so should you. She may have gone through her share of trials and tribulations. She’s come by the wisdom and maturity she’s associated with honestly. She may be a solitary figure but she’s not lonely. She’s comfortable in her own skin because she’s earned the right to stand tall, proud and dignified on her own. Look at the woman in this card. She’s not messing around. She’s either started the fire that surrounds her with a flick from her cigarette’s ash, or she’s a part of it — rising from the ashes like the powerful and vibrant Phoenix she resembles. If this is someone in your life, know that she’s here to teach you how to incorporate these qualities into your own psyche. She may be a boss, a mentor or a parental figure. Or she may be someone you look up to who knows how to get things done. If on the other hand this is you, know that it’s time to put aside your fears and uncertainties and step up to the plate. In the end you will be rewarded for doing so through the respect and admiration of others. This should be a relatively happy and fulfilling month for you, with the possibility of good tidings (and good news) coming to you from afar. The Knight of Cups can be a person in your life, someone who’s in touch with his (or her) emotions and is not afraid to express them. It can also manifest as a set traits that are going to be important for you to embrace. If it’s a person in your life, he can appear literally as a Knight in shining armor type individual, come to rescue you from the doldrums of your ordinary existence. But if you look at the imagery in this card, it’s not the Knight that is prominent. It’s the fair maiden, front and center. There are symbols of travel, escape and far away places all present in the imagery of this card. A merman in a sailboat. A cityscape reflected in the moonlight. An ocean of possibilities flowing from the woman’s fingertips. These are all references to the powers of creativity, inspiration and imagination. Is he going to sweep her off her feet and cart her away to some exotic locale? Or is this just some “take me away” fantasy that she’s immersed herself in? Whatever it is, this card says that your heart is wide open and ripe with potential. It says you’re ready to feel something magical and that you’re ready to share those feelings with another. The Knight of Cups isn’t about facing reality.There’s plenty of time for that in the realm of your day-to-day life. It’s about embracing your dreams and fantasies and if that means escaping into a romantic interlude then so be it. With Neptune and Chiron both turing direct in your sign this month, and with a lineup of planets moving through your 9th house, a message from far away is a strong possibility, If that message brings with it an invitation, you’d be a fool not to go. 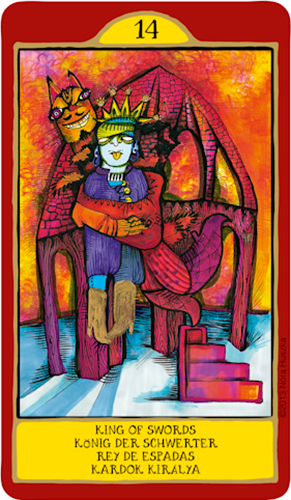 The deck used for this month’s tarotscopes is the Gypsy Palace Tarot, designed by Nora Huszka. Her beautiful deck can be purchased directly from her website, or from her Etsy storefront. This deck is also available for download through the Galaxy Tone website. Be sure to check out her Youtube channel and like her Facebook fanpage too! Used by generous permission. 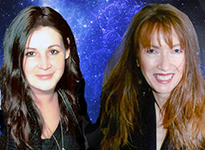 Check out this month’s horoscopes too!